Milli Gazete columnist İbrahim Veli writes on local elections. Here is the full article. It needs to prove the capacity in nearly all subjects from the technology to nature. Because in this century that the contests of cities are presented, it is inevitable for the future projection to manage opportunities reasonably. And it is impossible to catch new exits with the action plans that are based on memorizing. To start a period that could be witness for the ones who have the social networks that have the most extended horizon and analytical thought about human mentions a great importance. For this, the institutional and mental change that could handle the hardships can be possible with the planning of local government actors. With the cooperation of city and university, the city life that needs new diagnosises and new remedies is open to every candidate who will value the opinion and labor. The advantaged geographic location of cities are hungry for a production based on innovation that could build the tomorrow and could help being the center of attraction. It is necessary to be selective in the name of the municipality practices that transforms at a time that infrastructure municipality is over, social municipalities expect transformation and smart municipality wants to take stage. The precision that could shape the innovator character of the city should shape with a structure that values the government, has worth in the measure of clearness and accountability. With the cooperation of the world of city and work to focus on local development goals again, to produce new tools for the financeman of investment and to support the cooperative culture should be the new priorities. From work management to planning, the leaps that are intended for improving the innovator and high added value economy process will be appreciated by the new residents of the city. To build incubation centers in the name of increasing green business possibilities, to utilize from the civil society spirit for sustainable developments take parts among the qualifications for being elected. 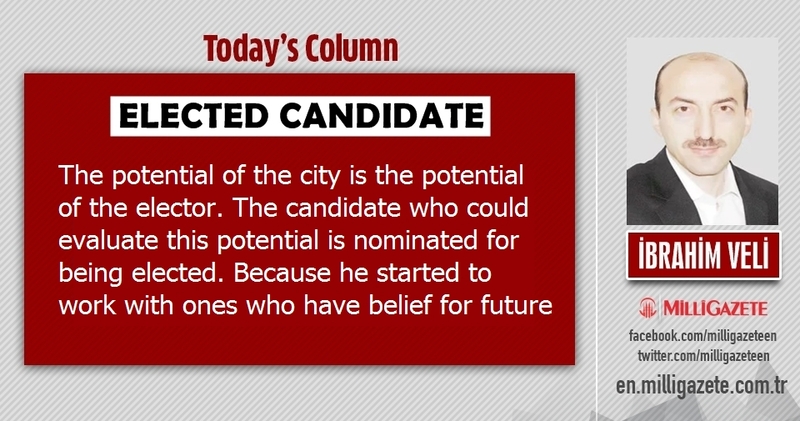 The potential of the city is the potential of the elector. The candidate who could evaluate this potential is nominated for being elected. Because he started to work with ones who have belief for future. The belief for the future is to meet the producing capacity that is intended for provide the strategic needs of city and the will of solving problems. This meeting can be provided with the planning and efficient use of resources in the context of cooperation networks and value chains. Everyone that is a candidate to has the responsibility of city has to meet expectations, facilitate today and improve tomorrow. Because the future will belongs to ones who direct the flow of water, not the ones who move according to the flow of water.